I have discovered another book to add to my love themed booklists, and this one deserves a spot near the top. 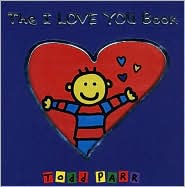 The I LOVE YOU Book by Todd Parr belongs in every child's library. A child can never hear the phrase, "I Love You" often enough. From the beginning with the large cut out silver-lined heart on the cover of the book to the end with a special message from Todd, the book will help you remind those special children in your life just how much you love them -- each and every single thing about them. The book emphasizes unconditional love, love no matter what the situation. Yes, you love them even when they are stinky, when they dance and even when they don't sleep. It is time to let them know. I can't believe I have never read any of Parr's books with my kids before. Wow, he has written quite a few of them, illustrating all in the same easygoing, happy manner. The short phrases and bright, bold, child-like illustrations make his books ideal for small children on up. The I LOVE YOU Book is a quick but heartwarming read. My daughter soaks it all in every time I read it to her. We always end with a big hug and kiss. The book was listed on The New York Times best seller picture book list in February. Todd Parr, I love you for writing this book! I luv " The I love you book". Wonderful book!